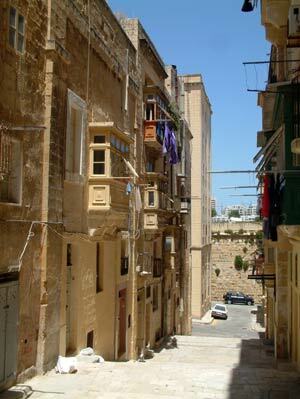 Photogenic Old Streets of Valletta with covered balconies and interesting architectural features. Lines of washing are often strung from one side of the street to to the other. Parking can be a problem since the buildings were not originally designed with cars in mind. It's best to leave your car behind and come to Valletta by bus. The city is so small that you can get everywhere on foot. There are also electric taxis that whizz around. Valletta is built on an iron grid pattern making it very easy to navigate. Free maps of the city are available from the Tourist Information office just inside the main gates near the Main Bus Station.